Tai shares such a positive vibe as chef and owner of Taco the Town in Brunswick, ME. 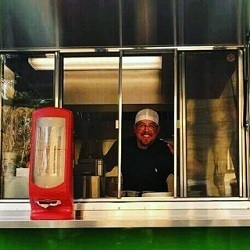 In a matter of months, Tai and his authentic Mexican food have received glowing reviews from numerous newspapers and social media platforms, but the biggest testament to his soulful food and top notch customer service is the loyal and new customers who line up every day at the Taco the Town food truck for a divine and authentic Mexican meal. “Everything is going to be okay” and “No Stinkin Thinkin” are two of Tai’s mantras that he focuses on during the busy times at his restaurant, but it took overcoming some tragic moments in Tai’s life for him to trust that everything will be okay and to remain focused on positive thoughts. So, what exactly is Tai, who grew up in California, doing in Maine? Tai shares some poignant and vulnerable challenges of his journey, and how he decided to risk it all in opening up Taco The Town. He truly has overcome a lot to get to this point, but Tai is settling in to believing and trusting that he is on the right path as owner, chef, friend, parent, and community leader. Tai, his vibe, and his food are TO LIVE FOR!